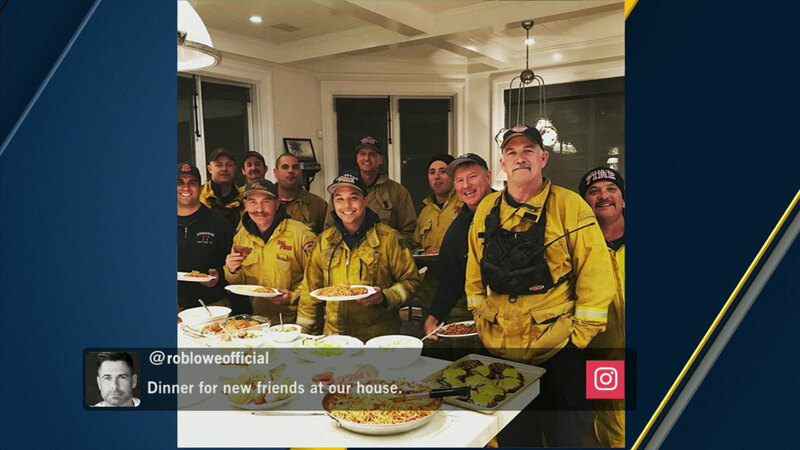 MONTECITO, Calif. -- Actor Rob Lowe, whose California home was threatened by the Thomas Fire, invited weary firefighters over for spaghetti and cheeseburgers to thank them for battling the massive blaze. The 270,000-acre fire has already destroyed several homes in Montecito and about 1,000 overall in Ventura and Santa Barbara counties. Photos posted to Lowe's Instagram account show a massive wall of flames in the background dangerously close to his home and Lowe in fire gear using a garden hose to try to protect his property. "Thank you to all the crews from all over the country who stood tall and saved my town. #respect #gratitude" Lowe wrote in one post.